President Donald Trump has ordered the withdraw of all United States troops in Syria. A US official made the disclosure on Wednesday, after President Donald Trump claimed America has “defeated ISIS” in the war-ravaged country. The stunning move will have extraordinary geopolitical ramifications — and plunges into uncertainty the fate of US-backed Kurdish fighters who have been tackling Islamic State jihadists, hundreds of whom remain in Syria. “We have defeated ISIS in Syria, my only reason for being there during the Trump Presidency,” the Republican leader tweeted. The US official told AFP that Trump’s decision was finalized Tuesday. “Full withdrawal, all means all,” the official said when asked if the troops would be pulled from across all of Syria. Critics from both main political parties were quick to assail Trump’s decision, saying it could embolden Ankara to attack US-backed Kurdish fighters. But the president’s military advisors and international allies warned him against a precipitous pullout and the mission continued. Echoing Trump, White House spokeswoman Sarah Sanders said IS has been defeated territorially, but the US-led coalition that includes dozens of nations would continue fighting the jihadists. A Pentagon spokeswoman said the department had “started the process” of bringing troops home. It was not immediately known what effect the troop withdrawal would have on air operations in Syria. These have been ongoing since late 2014. Ties have grown even more fraught since the US set up observation posts in northern Syria close to the border with Turkey to prevent any altercation between Ankara’s forces and the YPG. In a sign of possible rapprochement, however, the State Department said Wednesday it had approved the $3.5 billion sale of Patriot missiles and associated equipment to Turkey. The decision to withdraw marks a remarkable development not just for Kurds in Syria, but for long-established US doctrine in the region. A US presence in Syria is seen as key to pushing against Russian and Iranian influence in the country and across the broader region. Tehran-backed militias have supported the regime of Syrian President Bashar al-Assad, and Moscow in 2015 intervened in the conflict to prop him up. Republican Senator Lindsey Graham, a Trump ally, said the president’s decision was unwise. 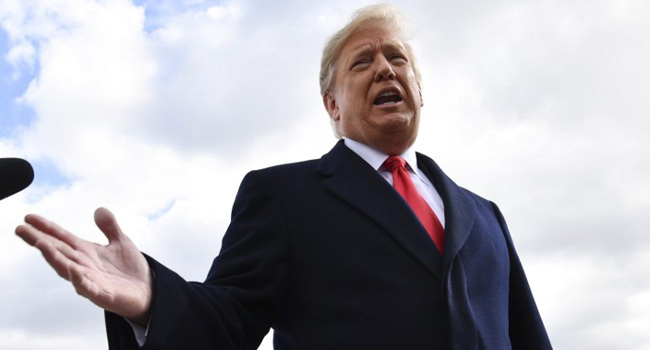 The post Trump Orders Full Withdrawal Of US Troops From Syria appeared first on Channels Television.